I think I have always loved to travel. As a young boy I would get on my bike and ride for miles and miles, sometimes more than 30 miles, just to get away. I loved an adventure and I would search for new places to see. The older I got, the further I wanted to expand my boundaries. I only wish I would have discovered traveling to far off countries sooner! I guess it was my first time traveling by air, on a trip to Florida in 1980, that I discovered I was captivated with airplanes. I also loved the sense of adventure, getting prepared to go cross country, knowing I would be meeting new people, visiting new places, that had me so excited I couldn’t sleep. Then, settled in my seat, it was time to depart from Sea-Tac. I was in Heaven…I loved the roar of the engines, the feeling of being pushed back into my seat from the take-off, angling up into the sky to somewhere I had never been. What isn’t there to love about flying off to a distant place? It took me a while before I was able to fly again. I was offered a job in the San Francisco Bay area in 1995, and one of the perks of that job was the opportunity to fly home to Seattle occasionally. Fortunately for me, I didn’t always have to wait for the company to fly me because Alaska and Reno Air were in the middle of price wars at the time. Tickets were going for $25 one way. I was having the time of my life flying back and forth from San Jose to Seattle! But, the job ended sooner than expected, and I wasn’t able to feed my addiction of flying for a while. Fast forwarding to 2003, I was finally able to experience my first trip overseas. 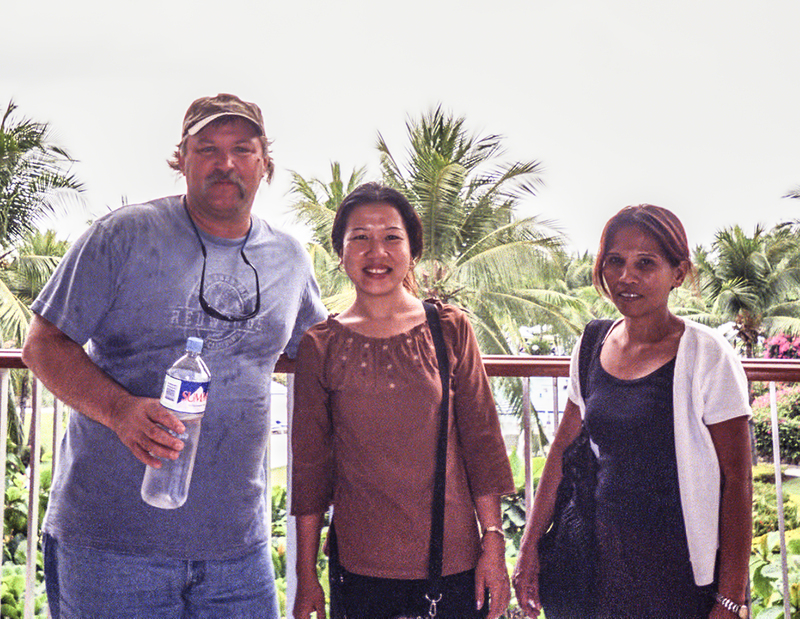 I went to meet my future wife, Loretta, in the Philippines. I flew during the SARS outbreak, so my family was worried that I might be exposed to the deadly virus, but I was only thinking about how I was ready to go on the biggest adventure of my life! I was crazy…I wasn’t worried about becoming ill, and it didn’t bother me a bit that I was facing a 13 hour flight to Hong Kong. I was just excited that I could watch newly released movies on the back of the seat in front of me, and drink Jack Daniels for free on an international flight! Because of SARS there were hardly any people on the plane, and I, along with the few other passengers, could stretch out across five seats on the almost empty Boeing 747 we were flying on. 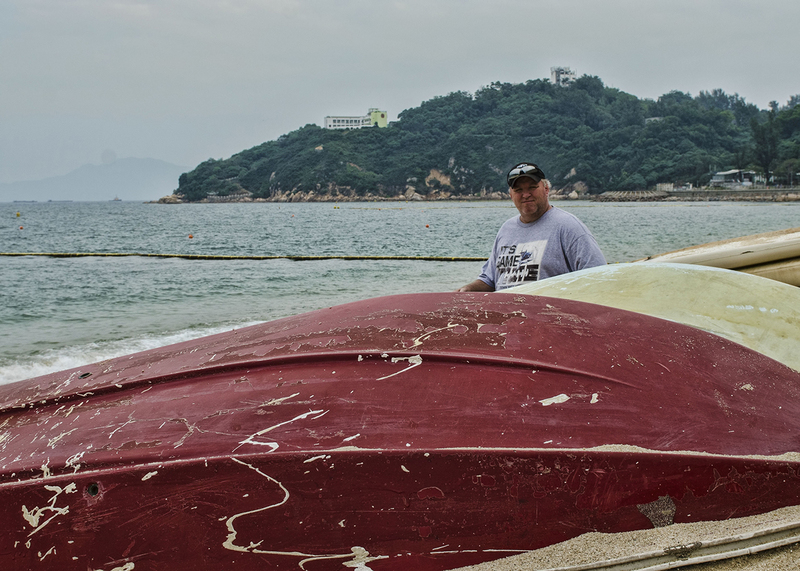 Once I landed in Hong Kong I was fortunate to have a 16 hour layover which allowed me to take a trip to the island. I, along with a new filipino friend I met on the flight, took off on the Airport Express. This is an awesome train that is extremely comfortable, and takes only 24 minutes to arrive to the Central Station in downtown Hong Kong. First stop for us was the Star Ferry terminal which is very near the Central Station where the train dropped us off. I had read about the Star Ferries; they had been in operation for over 100 years, and I couldn’t wait to take a roundtrip ride across Victoria Harbor. My new friend and I weren’t disappointed, getting quite the view of the Hong Kong and Kowloon skyscrapers for about 2HK dollars or about 25 US cents. They stood so tall, and were extremely impressive when viewing them from sea level! Most especially the 101 story IFC Tower that appears, at least from the harbor, as if it was built right next to the shoreline. 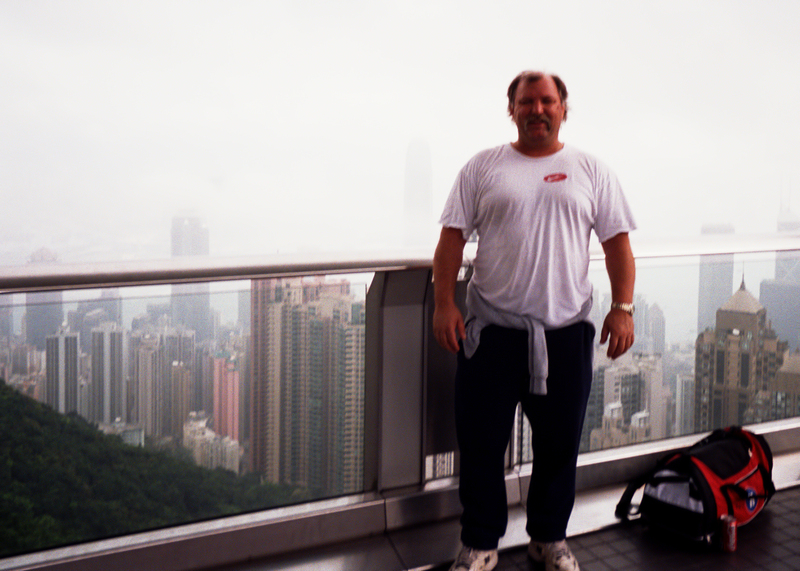 Next stop on our rather condensed tour of Hong Kong was the famous Victoria Peak. I had also read about this adventure, the white-knuckled ride on one of the double-decker buses to the top of the mountain. Winding through switchbacks, scaring the heck out of us, our bus gave us reason to pause when we reached our destination. I can’t remember, it’s been many years, but one or both of us might have had a bladder malfunction after the amusement/bus ride that had just ended! My photo doesn’t do the view justice, and it was fairly foggy at times up at the Peak, but we were definitely NOT disappointed. It is a sight that everyone should see, a city with more high-rises than any other in the world. After spending several hours at the top, it was time for me and my friend to make our way back to the airport. My visit to Hong Kong was an experience I will never forget, along with my two weeks in the Philippines. It was all too short, and all I could think of was when would I get the opportunity to go back. Now, years later, I have been fortunate to take three more trips to the Philippines, along with three extended visits to Hong Kong. On my last trip to South East Asia, I was also was able to spend time in Thailand, Taiwan, and Vietnam. I can’t wait to go back to S.E. Asia. This is the place that takes my heart away. I’m thinking about teaching English in Taipei, Taiwan in the future, and to also continue my quests around the region. Maybe a motorbiking trip from Laos to Singapore, who knows! I have fallen in love with traveling to other countries, and my only hope and wish is that everyone could experience the wonderful cultures of the people in these different lands. I hope you will be inspired by my stories to take the next step and go see the world!